Every geologist mapping or describing folds in the ﬁeld probably has the same question in mind: how did these structures actually form? As geologists we tend to look for a simple history or mechanism that can explain our observations reasonably well. Folding is no exception, and there are different approaches and process-related terms. One approach is to consider the way force or stress acts on a layered rock, which leads to the three-fold classiﬁcation and terminology. 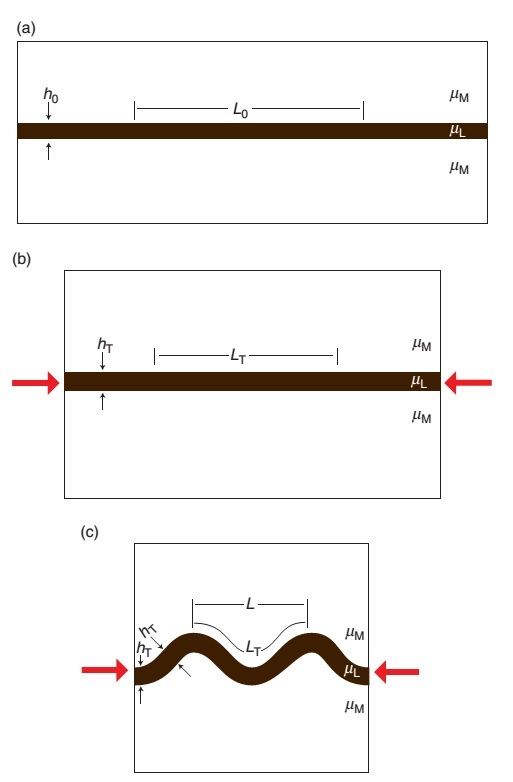 Other terms are related to how the layer(s) react to force and stress, for instance whether layers fold by layer-parallel shearing, orthogonal ﬂexure or some other mechanism that is controlled by rock rheology. Still other classes of folding, such as kinking and chevron folding, are related to fold geometry. For this reason, several different fold mechanisms are deﬁned, and many of them overlap in deﬁnition. This is why terms such as buckling, kink folding and bending can be confusing when discussed in terms of mechanisms such as ﬂexural slip and simple shear. In summary, we are dealing with differences in orientation of stress axes relative to the layering, kinematics, and mechanical and rheological properties, and thus mechanisms that emphasize different aspects of folding. The most important distinction between the ways folds form probably lies in whether the layering responds actively or passively to the imposed strain ﬁeld. Now considering active folding (buckling), where the competence or viscosity contrast between the folding layer and its host rock is important. We will then look at passive folding, where layers are simply passive markers with no rheological inﬂuence, and then consider bending, where forces are applied across the layering. The following sections will then discuss models known as ﬂexural folding mechanisms (ﬂexural slip, ﬂexural shear and orthogonal ﬂexure), which can contribute to both active folding and bending. Finally, we will discuss kinking and the formation of chevron folds. Active folding or buckling is a fold process that can initiate when a layer is shortened parallel to the layering, as shown schematically. Folds appear to have formed in response to layer-parallel shortening. A contrast in viscosity is required for buckling to occur, with the folding layer being more competent than the host rock (matrix). The result of buckling is rounded folds, typically parallel and with more or less sinusoidal shape. Two folded layers of different thickness. The upper and thinner one shows a smaller dominant wavelength than the lower one. Buckling occurs when a competent layer in a less competent matrix is shortened parallel to the length of the layer. If an isotropic rock layer has perfectly planar and parallel boundaries and is perfectly parallel with a constantly oriented s1 or ISA1, then it will shorten without folding even though there is a signiﬁcant viscosity contrast between the layer and the host rock. However, if there are small irregularities on the layer interfaces, then these irregularities can grow to form buckle folds with a size and shape that depend on the thickness of the folded layer and its viscosity contrast with its surroundings. 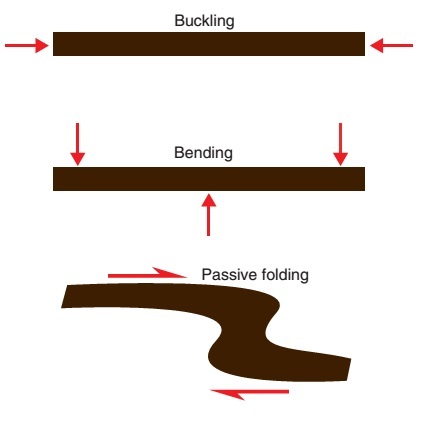 Buckling or active folding implies that there is layer parallel shortening and a viscosity contrast involved, and also irregularities on which folds can nucleate. 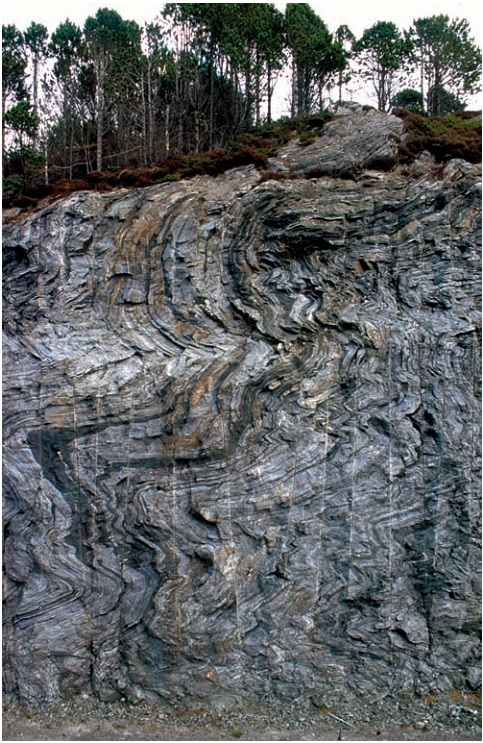 Alternating Class 1B and 3 folds are commonly seen in folded layers. CompetentlayersexhibitClass1Bgeometry. The fold wavelength–thickness ratio (L/h) is constant for each folded layer if the material is mechanically homogeneous and if they were deformed under the same physical conditions. Such folds are often called periodic folds. If the layer thickness varies, then the wavelength is changed accordingly. The effect of the folding disappears rapidly (about the distance corresponding to one wavelength) away from the folded layer. The folds in the competent layer approximate Class 1B folds (constant layer thickness). If there are two or more folded competent layers then the incompetent layers in between are folded into Class 1A and Class 3 folds. Cusp (pointed) hinges point to the more competent layers. Strain distribution in the hinge zone of a folded limestone layer in shale. Outer-arc stretching is separated from inner-arc shortening by a neutral surface. The outer part of the competent layer is stretched while the inner part is shortened. The two parts are typically separated by a neutral surface. Note that layer-parallel shortening, which always takes place prior to folding, can reduce or eliminate the outer extensional zone. The normal to the axial surface or axial cleavage indicates the direction of maximum shortening (Z). Experiments and theory show that homogeneous shortening (T) occurs initially, together with the growth of irregularities into very gentle and long-amplitude fold structures. When the most accentuated folds achieve opening angles around 160–150 , the role of layer-parallel shortening decays. From that point on the folds grow without any signiﬁcant increase in layer thickness. Buckling has been modeled under the assumption of linear or Newtonian viscosity. It is likely that most rocks show non-linear rheological behavior during plastic deformation, which has consequences for the buckling process. A power-law rheology is then assumed, where the exponent n > 1. The higher the n-exponent, the quicker the fold growth and the less the layer parallel shortening T. Many natural folds show low T-values, and, together with low L/h ratios (L/h < 10), this indicates a non-linear rheology. However, the differences between the results from viscous and power-law rheology models are not great. Buckle folds are most easily recognized as single competent layers, but can also occur where several competent layers occur in parallel. Ld/h is signiﬁcantly less for multilayer than for single layer buckling. Where two thin layers are close they will behave more like a single layer whose thickness is the sum of the two thin layers, as seen from the experimental results. Folding of multi-layered rocks. Far-apart layers act as individual layers (left). The closer they get, the more they behave as a single layer with thickness larger than that of the thickest of the individual layers. Where we have alternating thick and thin layers, the thin layers will start to develop folds ﬁrst. At some point the thick layers will start to fold (with longer wavelength) and take control over the further development. The result is relatively large folds controlled by thick layers together with small, second-order folds formed earlier in the process. Illustration of how folding initiates in thin layers. Once the thicker layer starts to fold, the smaller folds in the thin layer become parasitic and asymmetric due to flexural flow. Several mechanisms can be involved during buckling. The simple stones can collectively be termed ﬂexural folding and are separated into orthogonal ﬂexure, ﬂexural slip and ﬂexural ﬂow. In addition there is always the possibility of having volume change, particularly in the hinge zone. Buckled multi-layers. Note how the largest folds affect the entire layer package. Passive folding is typical for rocks where passive ﬂow occurs, i.e. where the layering exerts no mechanical inﬂuence on the folding. In these cases the layering only serves as a visual expression of strain with no mechanical or competence contrast to neighbouring layers. Such layers are called passive layers. 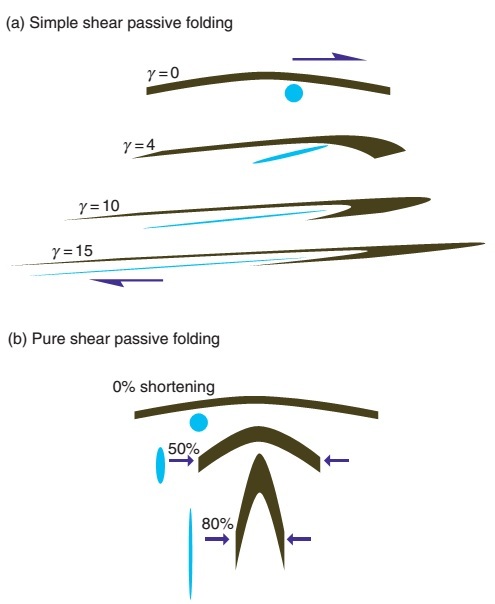 Perfectly passive folds produced by simple shear are Class 2 (similar) folds, and passive folds that are associated with simple shear, or atleast a signiﬁcant component of simple shear, are called shear folds. 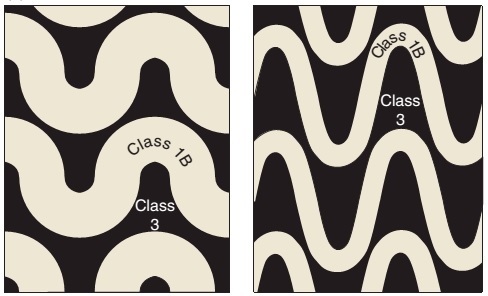 Formation of Class 2 folds by (a) simple shearing and (b) pure shearing of a gently curved layer. No viscosity contrast is involved, meaning that the folds can be regarded as passive. Passive folds generated by simple shearing are perfectly similar folds. Passive folds of perfect Class 2 geometry can easily be generated by differentially shearing a card deck. Drawing lines perpendicular to the cards prior to shearing helps visualize the fold. However, the formation of passive folds is not restricted to simple shear. Passive folds can form in response to any kind of ductile strain, for instance sub-simple shear, transpression and even coaxial strain. Hence simple shear is only one of an inﬁnite spectrum of kinematic models that can produce passive folds. Passive folding produces harmonic folds where the layering plays no mechanical role and therefore no inﬂuence on the fold shape. Examples of passive folding are found where passive layers enter shear zones or otherwise are affected by heterogeneous strain. Drag folds along faults are examples typical for the brittle regime, although many layered sequences contain beds of quite different mechanical properties so that slip occurs between layers. Passive folds are frequently found in mylonite zones, particularly in mono-mineralic rocks such as quartzite, marble and salt. Passive harmonic folding of quartzite in a Caledonian mylonite zone. The similar geometry of this Z-fold and its setting in a Caledonian shear zone indicate that it is a shear fold. Bending occurs when forces act across layers at a high angle, unlike buckle folds where the main force acts parallel to a layer. This is also the case for passive folding, and the two are closely related. However, bending is generally thought of as something that is more directly forced upon the layers by geometries and kinematics of the bounding rock units. Several aspects of bending have been studied in great detail by engineers because of its importance in the ﬁeld of construction engineering, such as in horizontal beams supported by vertical pillars. Bending occurs when forces act across layers, and may involve more than one mechanism. Classic geologic results of bending are the forced folds created in sedimentary layers blanketing faulted rigid basement blocks. 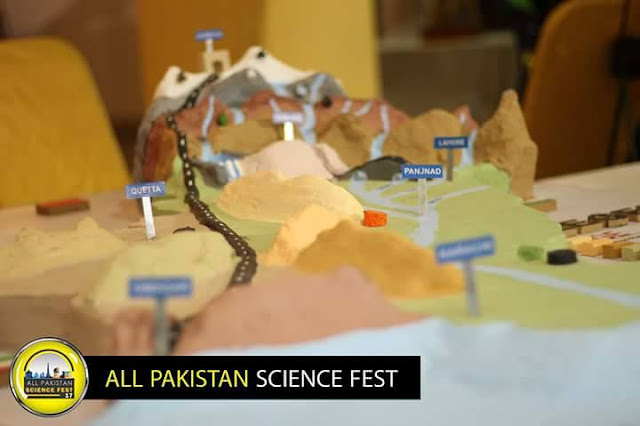 The displacement is forced upon the sediments by fault movement on a pre-existing basement fault, and the sediments are soft enough to respond by monoclinal folding until at some critical point they rupture and the fault starts propagating up-section. Such structures are particularly well exposed in the Colorado Plateau–Rocky Mountains area, where numerous Laramide-related uplifts have created such structures. Bending as such is a boundary condition- or external load-related model, not a strain model, particularly not when a free surface is involved such as during forced folding mentioned above. In other words, there are many ways that folding and strain can accumulate internally in a fold during bending. 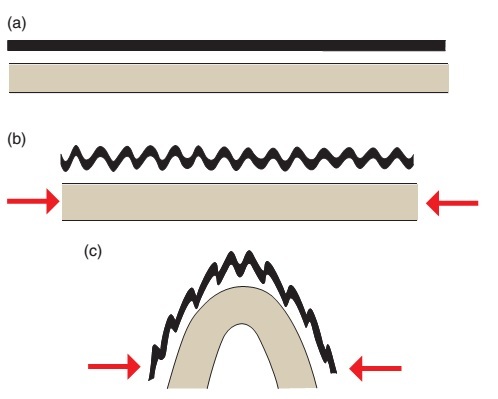 Examples of bending in various settings and scales: (a) between boudins; (b) above thrust ramps; (c) above reactivated faults; and (d) above shallow intrusions or salt diapirs. An obvious response to bending is deformation by simple shear, in which case we are back to passive folding. The simple shear passive folding model may work if we have a wide fault zone underneath the fold or if the fold is very narrow. In most cases the fold widens upward, telling us that we have to modify the simple shear model. In this case trishear comes in handy. Trishear distributes shear in a triangular zone ahead of a propagating fold, and seems to work very well for several mapped examples. Still, trishear cannot explain all features seen in many forced folds. 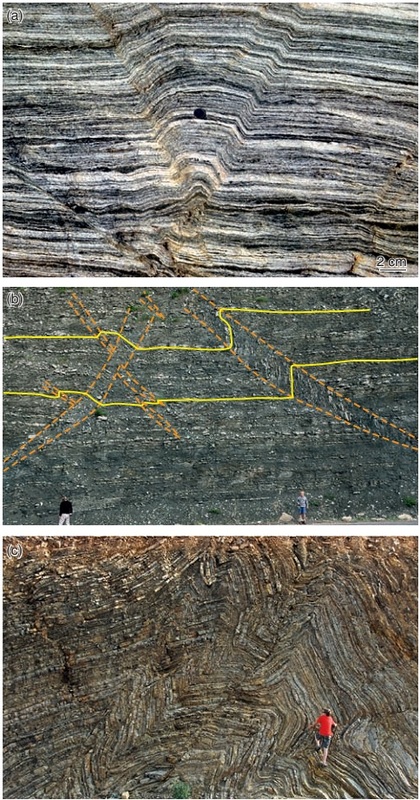 Field studies show evidence of bedding parallel slip or shear. 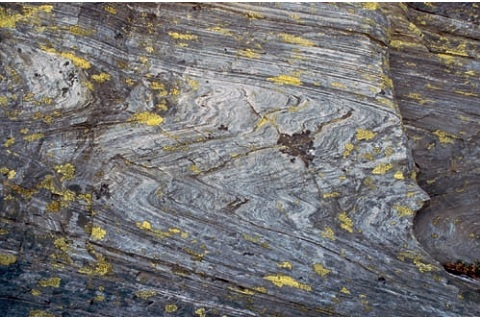 This is manifested by striations on weak bedding-parallel surfaces or by bedding-parallel deformation bands. Also the related ﬂexural mechanism described below as orthogonal ﬂexure can result from bending loads. There are many other examples of bending. One is fault-bend folds, for instance where thrust sheets are passively bent as they move over a ramp structure. Such folds are commonly modelled as kink folds, again related to ﬂexural slip. They may also be modelled by means of simple shear, which is commonly done for fault-bend folds formed above non-planar (e.g. listric) faults. 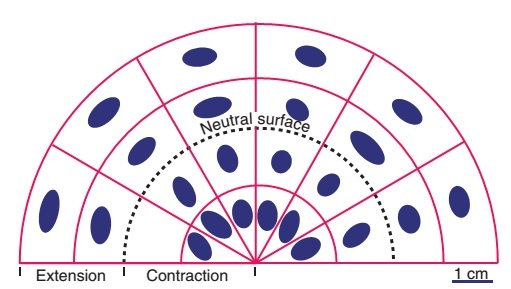 Differential compaction, where a sedimentary sequence compacts more in one area than in another due to different degrees of compaction of the underlying layers, is also a type of bending. This is common across the crests of major fault blocks in post rift-sequences in sedimentary basins, but can also occur along salt diapirs and shallow intrusions. Folds formed by differential compaction are gentle. Forceful intrusion of magma or salt can also bend roof layers. Again the strain accumulation mechanism may vary, with ﬂexural slip being a common constituent. In the plastic regime, bending is less common because of the high ductility of all or most parts of the deforming rocks. However, bending is frequently associated with rigid boudins. Passive folding of layers between boudins. (a) Flexural slip, showing opposite sense of slip on each limb, decreasing towards the hinge zone. (b) Flexural flow, where fold limbs are being sheared. Ideally, layer thickness is preserved in both models. Flexural slip implies slip along layer interfaces or very thin layers during folding. It is one of three kinematic models of folding (the others being ﬂexural ﬂow and orthogonal ﬂexure) that maintains bed thickness and thus produces Class 1B or parallel folds. Simple ﬂexural slip experiments can be performed simply by folding double sandwiches with jelly. The sandwich maintains its thickness even though slip occurs between the pieces of bread, until the fold becomes too tight. It is a prerequisite for ﬂexural slip that the deforming medium is layered or has a strong mechanical anisotropy. In nature, the anisotropy could be mica-rich thin layers in a quartzite or mylonite, or thin shale layers between thicker sandstone or limestone beds in sedimentary rocks. 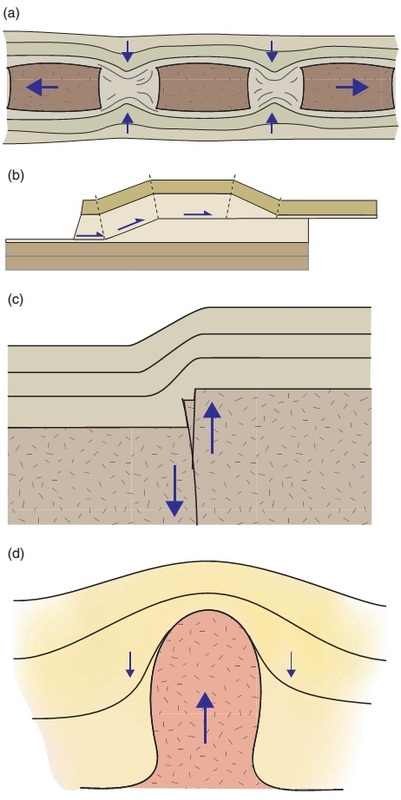 Flexural slip can occur in the middle crust where plastic deformation mechanisms would be involved, but is perhaps more common where sedimentary strata are folded in the upper crustal brittle regime. In the latter case, bedding surfaces act like faults, and slicken lines will sometimes develop on slipping surfaces. Maximum slip occurs at the inﬂection points and dies out toward the hinge line, where it is zero. The sense of slip is opposite on each limb, and the slip is consistent relative to the hinges, where sense of slip changes. Relative slip on the convex side of a ﬂexural slip fold is always toward the fold hinge, whereas on the concave side slip is opposite. Slicken lines on folded weak layers and constant bed thickness reveal ﬂexural slip. 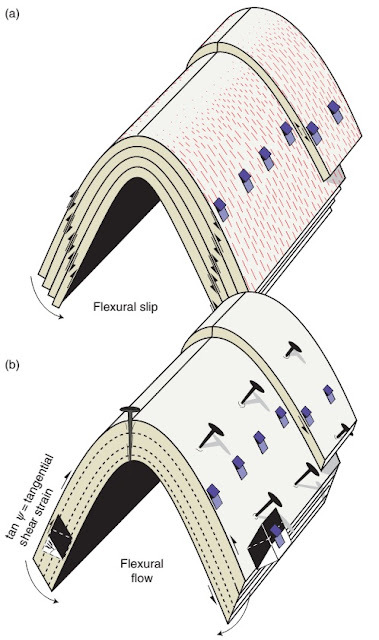 In cases where strain is more evenly distributed in the limbs in the form of shear strain, as is more commonly the case in the plastic regime, ﬂexural slip turns into the closely related mechanism called ﬂexural shear or ﬂexural ﬂow. Flexural ﬂow experiments are conveniently done by bending a soft paperback book or a deck of cards (remember to draw circles for strain markers). During this process slip occurs between individual paper sheets. If we put strain markers on our paperback, we would see that strain is zero in the hinge zone and increasing down the limbs. This is so because the shear strain is directly related to the orientation (rotation) of the layers: the higher the rotation, the higher the shear strain. For originally horizontal layers folded into an upright fold, shear strain is directly related to dip (g ¼ tan (layer dip)), and the sense of shear is opposite on each side of the axial trace. This results in a characteristic strain distribution in the fold. For example, the neutral surface separating extension from contraction, typical for many buckle folds, is not found in pure ﬂexural-ﬂow folds. Flexural ﬂow produces identical strain in the inner and outer part of a fold, but strain increases away from the hinge. Note that evidence for a combination of orthogonal ﬂexuring and some ﬂexural ﬂow or slip is commonly found in buckle folds, in which case a neutral surface may well exist. Pure ﬂexural folds have no neutral surface, and strain increases away from the hinge zone. Pure ﬂexural folds are perfect Class 1B folds. We can estimate the amount of layer-parallel shortening for such folds by measuring the length of any one of the folded layers. This layer has maintained its original length because it was the shear plane throughout the folding history. Constant layer length and thickness are assumptions that simplify restoration of cross-sections. All lines originally orthogonal to the layering remain so throughout the deformation history. The result is stretching of the outer part and shortening of the inner part of the folded layer. The long axis of the strain ellipse is therefore orthogonal to bedding in the inner part of the layer and parallel to bedding in the outer part. Layer-parallel shortening resulting in orthogonal flexure and flexural flow. Note what happens to the originally orthogonal lines. Strain ellipses are indicated. Orthogonal ﬂexure and ﬂexural ﬂow have in common that they produce parallel (Class 1B) folds. 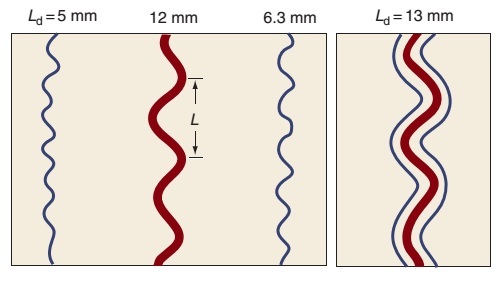 But the two models produce quite different strain patterns: The neutral (no strain) surface separating the outer-extended and inner-contracted part of the folded layer does not exist in ﬂexural ﬂow, where strain is identical across the fold along dip isogons. 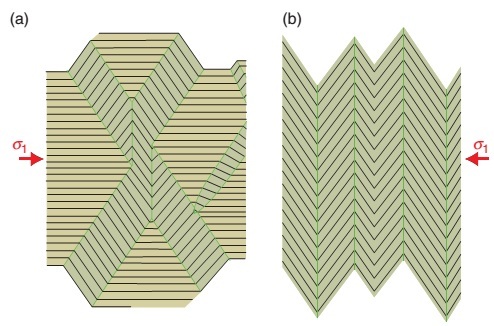 During the folding history, the neutral surface moves inward toward the core of the fold, which can result in contraction structures overprinted by extension structures. Orthogonal ﬂexure produces parallel folds with a neutral surface. Pure orthogonal ﬂexure is only possible for open folds. When folds get tighter, the conditions for orthogonal ﬂexure become harder and harder to maintain, and ﬂexural slip or ﬂow will gradually take over. Evidence for orthogonal ﬂexure is typically found in stiff, competent layers that resist ductile deformation. Some have simpliﬁed the deﬁnition of orthogonal ﬂexure to a mechanism resulting in outer-arc contraction and inner-arc extension. By getting rid of the requirement of orthogonality, the model becomes more general and embraces many more natural examples. 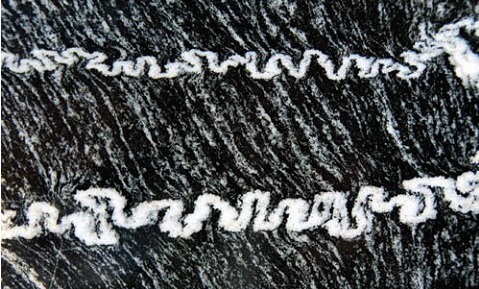 (a) Conjugate kink bands in mylonitized anorthosite gabbro, Bergen, Norway. (b) Kink folds related to Laramide thrusting in north Wyoming (Dead Indian Summit) (c) Kink-like folds in oceanic sediments in Oman. grade) deformation structures where there is a signiﬁcant mechanical anisotropy represented by lamination or repeated competent–incompetent layers, and both imply layer shortening. Classic kink bands have very angular hinges and lack even the narrow hinge zone found in the outer arc of chevron folds. There is another important difference between the two. While chevron folds initiate with their axial surface perpendicular to the shortening direction, kink bands form oblique to this direction, typically in conjugate pairs. (a) The orientation of s1 can be determined from the orientation of conjugate sets of kink bands. (b) Continued kink band growth can produce chevron folds. When conjugate sets of low-strain kink bands are observed, s1 or ISA1 is commonly assumed to bisect the sets. Going from strain to stress is not straightforward, but the smaller the strain the better the correlation. When a single set of kink bands occurs, we know that s1 is oblique to the band, but its precise orientation is unknown because kink bands may rotate during progressive deformation. Kink folds generated by bending do not directly reveal the orientation of stress. Such kink folds have orientations that are controlled by the local geometries of ramps or fault bends. Hence, in such cases the bisecting axis between two kink zones does not in general represent s1 or ISA1. Experiments have shown that conjugate sets can nicely merge to form chevron folds if strain is high enough (around 50%). However, 50% shortening is not commonly achieved by kinking in naturally deformed rocks, so this way of forming chevron folds may not be the most common one after all. 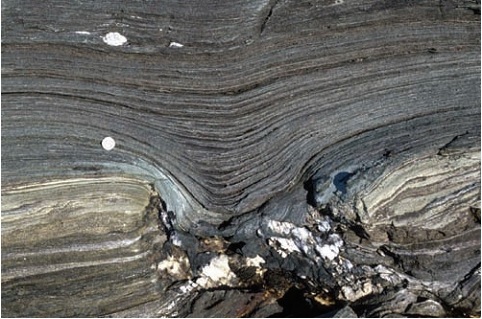 Classic chevron folds with beds on the centimetre scale are more likely to form by ﬂexural slip of multi-layered rocks during layer-parallel shortening. The typical setting is where competent beds are separated by thin incompetent layers, for instance quartzite or chert separated by shale or phyllite. Flexural slip then occurs between the competent layers, which are strained only in the thin hinge zones. Just like buckle folds, the hinges have to stretch in the outer arc and shorten in their inner parts. Furthermore, geometric problems in the hinge zone require ﬂow of the incompetent rock into the hinge, or alternatively inward hinge collapse of the competent bed. Hinge collapse is particularly common in relatively thick competent layers that occur between thinner ones. Another way of resolving hinge compatibility problems is by reverse faulting. Is There Oil Beneath My Property?